Syrian rebels have seized a key town on a main highway between Damascus and the south in their latest advance in Daraa province on the border with Jordan, a watchdog said on Friday. "Rebels seized control of Dael after destroying the three army checkpoints at the entrances to the town," the Syrian Observatory for Human Rights said. "The town is located on a main road linking Daraa to Damascus." The Britain-based watchdog said that a child was among 10 civilians killed in the fighting for the town over the past 24 hours. At least 15 rebels and a media activist working with them were also killed, along with 12 loyalist troops, it added. "Large swathes of Daraa (province) are now under rebel control. Their advance in the south is escalating," Observatory director Rami Abdel Rahman told AFP. "The rebels are inching closer to the provincial capital, and several towns and villages are now out of army hands. Daraa city is cut off almost completely from Damascus," he added. The capture of Dael came a day after a loyalist MP from the province raised the alarm in parliament. Walid al-Zohbi said the rebels are advancing "in all towns and villages in Daraa province, which is torn from east to west after the army withdrew from many positions". "They may have pulled out for tactical reasons, we don't know. But at any rate, terrorists from Al-Nusra Front have taken their place," he added of a jihadist group with roots in Iraq which is blacklisted by Washington as a terrorist organisation. On Sunday, the Observatory reported that the rebels had seized a swathe of land stretching 25 kilometres (15 miles) east to west along the Jordanian border to the sensitive ceasefire line between Syria and Israel. On the outskirts of the capital, new violence erupted in several districts including Qaboon and Yarmuk, the Observatory said. 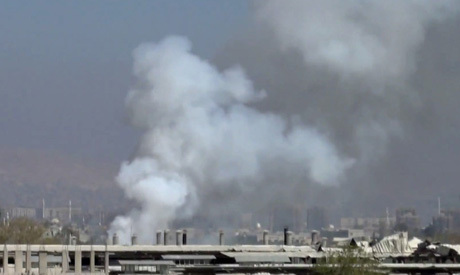 It came after at least 15 people -- 14 students and a child -- were killed in a mortar attack on Damascus University on Thursday, the Observatory and state media reported. They were among at least 150 people killed nationwide -- 52 civilians, 61 rebels and 37 soldiers, according to the Observatory's figures. In all, more than 70,000 people have been killed in Syria since March 2011, the UN says.